Halloween is not that long ago and there’re still scary sims up to visit. 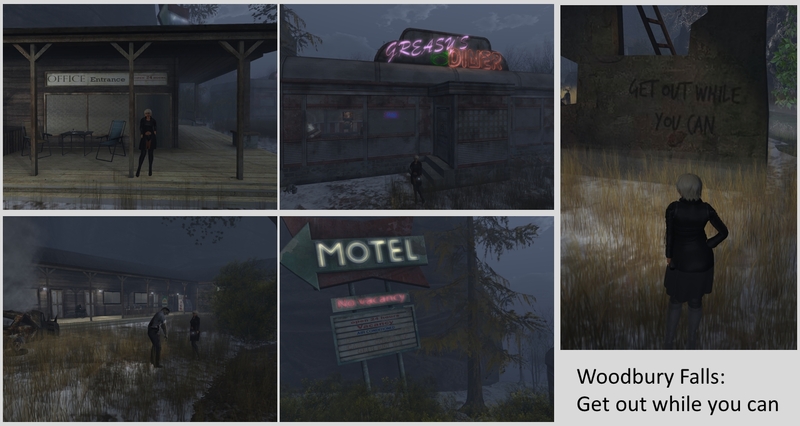 Saturday, November 12th, I went to Woodbury Falls which is listed in the SL destination guide. Upon your arrival at Woodbury Falls you should grab a flashlight as you’ll need it. Just across from the landing point there’s the entrance to an old mine, easy to recognize by the lonely dead body hanging just left of the entrance. I dared to walk in. Its dark inside and you shouldn’t be easily fainted. As I walked along the old tracks, I literally stumbled over dead bodies. Around one corner a bloodied woman suddently appeared and really scared me for a moment. 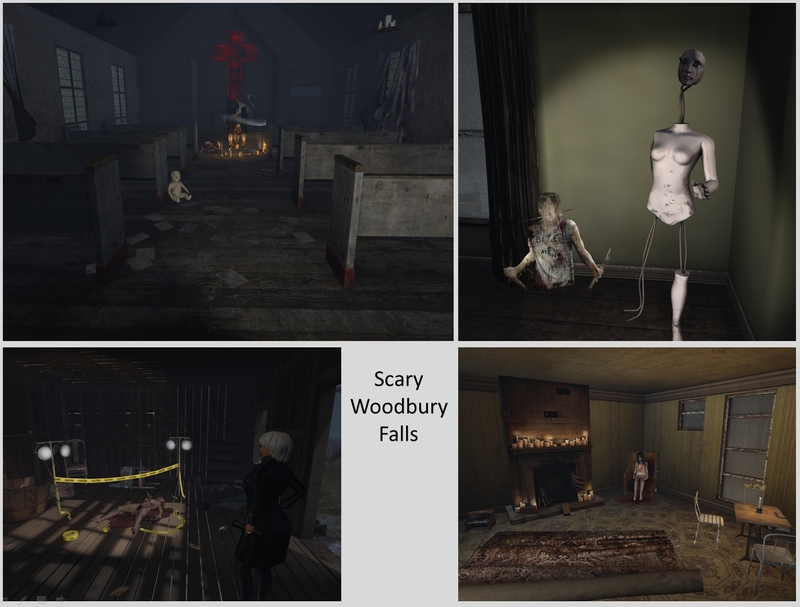 When you visit Woodbury Falls get used to dead bodies, they are everywhere. In the forest, there must have been a massacre. Dead bodies hang from the trees like leaves…. The town itself has all what you’d expect from a town: a church, a theatre, a cemetry, a motel. All seemed to be abandoned but there’re people. Kids gather in the church for ritual prayers. And if you enter resident homes what you see is either dead bodies, a crime scene or a bloodied child staring shocked into this surreal world. 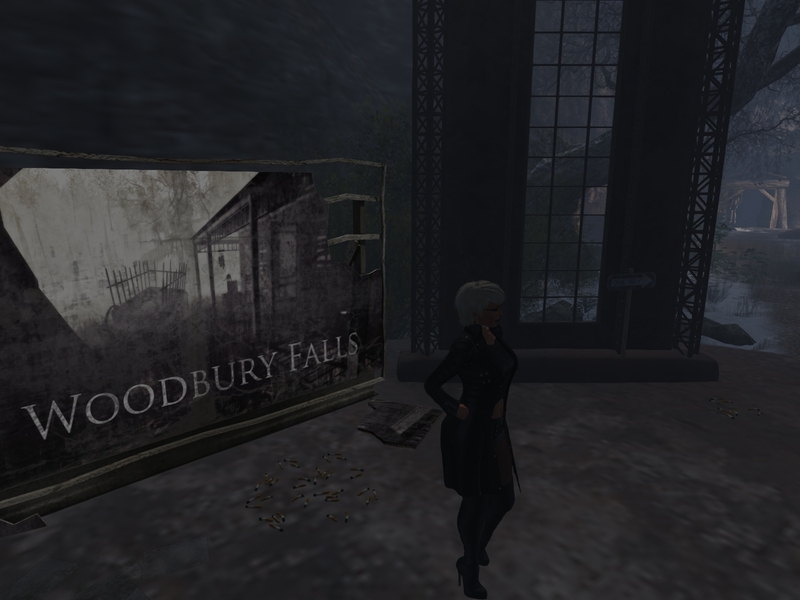 Yes, Woodbury Falls is not for the fainted heart. It is dark, scary and depressing. It is for those who love this kind of scenery – and I did enjoy my visit as there are so many details to discover. Thank you Zaccai R. Wolfe (robesz) for providing this sim to us!